Kajukenbo is an American martial art that was founded in 1947 at Palamas Settlement on Oahu, Hawaii. It developed out a group calling themselves the "Black Belt Society", which consisted of black belts from various martial arts backgrounds who met to train and learn with each other. This was the beginning of an evolutionary, adaptive style designed to combine the most useful aspects of the arts. Philosophical Meaning of Kajukenbo: "Through this fist style one gains long life and happiness." Kenpo emerged as the core around which this new art was built. Although uncreditted by name, other influences included American Boxing (Choo was Hawaiian Welterweight Champion) and Escrima (Emperado also studied Kali and Arnis Escrima). In the late 1940's, Palamas Settlement was a violent area and fist-fights or stabbings were commonplace. From this environment, the founders of Kajukenbo wanted to develop an art that would be readily usefull on the street. As they trained and fought in and around Palamas Settlement, the founders of Kajukenbo quickly gained reputations as formidable street-fighters. In 1950, Adriano Emperado, along with brother Joe Emperado, began teaching the new art in an open class. 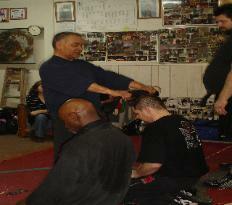 They called the school Kajukenbo Self Defense Institute (K.S.D.I.). From it's beginnings, Kajukenbo was an ecclectic and adaptive art. As time has passed, Kajukenbo has continued to change and evolve. 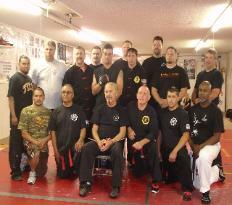 Currently, there are a few distinct, "recognized" branches of Kajukenbo: Kenpo ("Emperado Method" or "Traditional Hard Style"), Tum Pai, Chu'an Fa, Wun Hop Kuen Do, and Gaylord Method. In addition, there are numerous "unrecognized" branches, including CHA-3 and Kenkabo. While this may be confusing for an outsider, it is the essence of the art. Students are not required to mimic the teacher, but are encouraged to develop their own "expression" of the art.